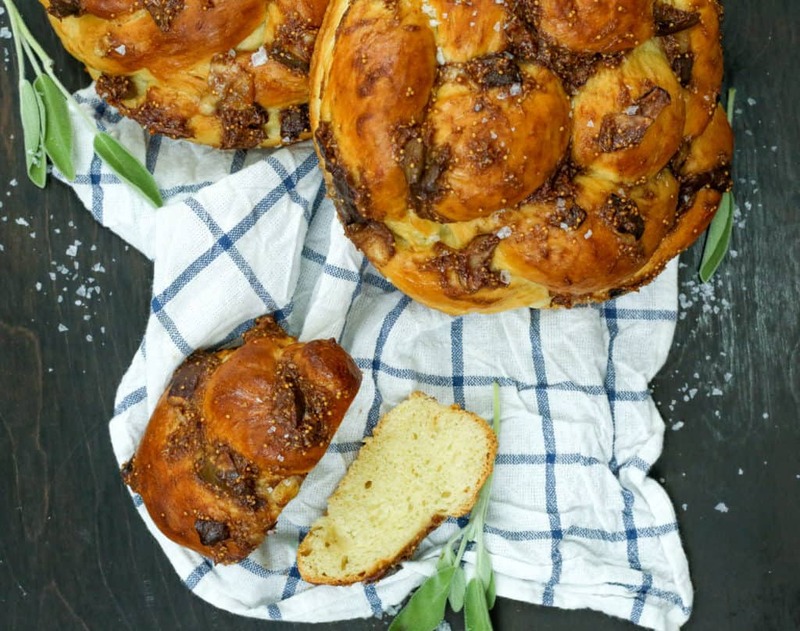 Fig Challah: there are no words. Okay, maybe a few. You all know by now that I have an obsession with figs. I don’t know if it’s because they’re such an elusive fruit, available only for a few months out of the year before they’re gone again, or if they’re just so different from any other fruit. Either way, they hold a special place in my heart. A few weeks ago I was playing around with some new challah topping recipes and decided to try something with figs, because how could I not. I thought about what flavors would go well with figs and two immediately came to mind: halva and marzipan. Nothing against halva, but this time I decided to try it out with marzipan because I never used it before and wanted something new. It was an instant success. The figs and marzipan worked so well together, and when I added in the cardamom it went to a whole other level. I needed to tone down the sweetness a little, so I added some balsamic vinegar and that did the trick. It added a hint of acidity without overwhelming everything else, so I felt like it complemented the other flavors quite nicely. The Maldon salt was the finishing touch, bringing everything together for the perfect combination of extraordinary flavors. When I first tasted this challah, I instantly thought of Rosh Hashana. It felt like the perfect challah for the holiday. Figs may not be one of the official simanim (symbolic foods) but they still play a big role since they’re one of the seven species of Israel. 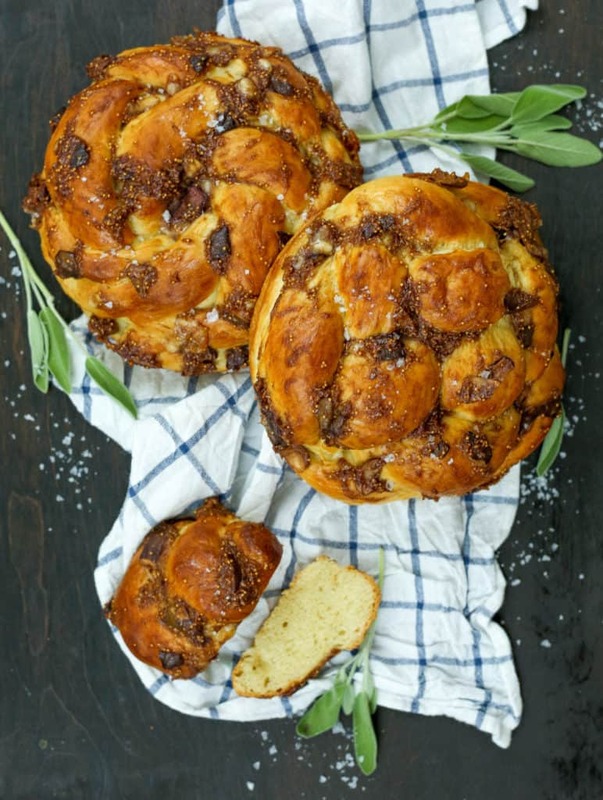 We also tend to prefer our challah on the sweeter side on the New Year, so this was a much tastier substitute to the typical raisin challah with more interesting flavors than the classics. I cannot wait to pair it with all that honey we’ll dip our challah into in a few days. In the bowl of a stand mixer, combine 5 cups of flour with the rest of the sugar and salt. Start your mixer and slowly add in the eggs, honey, and oil. Mix well. Once the yeast is proofed (it should be very foamy and have a distinct smell, if not it's not alive and you should start the first step over again) add to the flour mixture and mix until all ingredients are well incorporated, adding another 2.5 cups of flour slowly. In the summertime, or when it is humid, you will probably need to add another 1/2 cup of flour. Knead the dough using a stand mixer for 7-10 minutes. Once the dough has formed into a ball around the hook and the dough is smooth and elasticy to touch, remove the dough, coat the bowl with oil and place the dough back in and cover with a towel. Set aside to rise for 1-2 hours (or until doubled in size) in a warm, draft-free spot like the inside of your oven when it's off. Once it's risen, punch the dough down. Split your dough either into 2 or 4 pieces and then braid into a circle or make one long rope and twirl around. Place into an oiled tin, cover and allow to rise for 30 minutes. Egg wash the challah and bake for 20 minutes. Meanwhile mix together all the topping ingredients besides the salt. After 20 minutes, remove the challah from the oven, egg wash again and then spread the fig topping all over the tops and place back in the oven for 15 minutes. 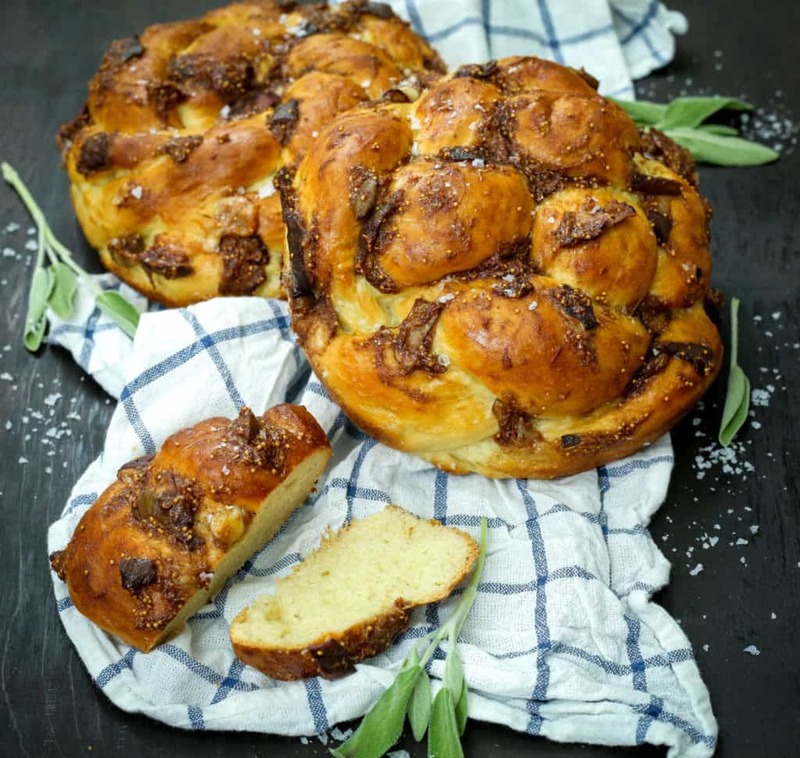 Top the challah's with Maldon salt as soon as they come out of the oven. Serve the challah hot. If you do not like marzipan, you can replace it with halva for another great combo. Also if you do not have Maldon salt, sprinkle a little pink Himalayan salt, right when it comes out of the oven.